Original Editors - Megan Clayton & Jaclyn Muenchow from Bellarmine University's Pathophysiology of Complex Patient Problems project. 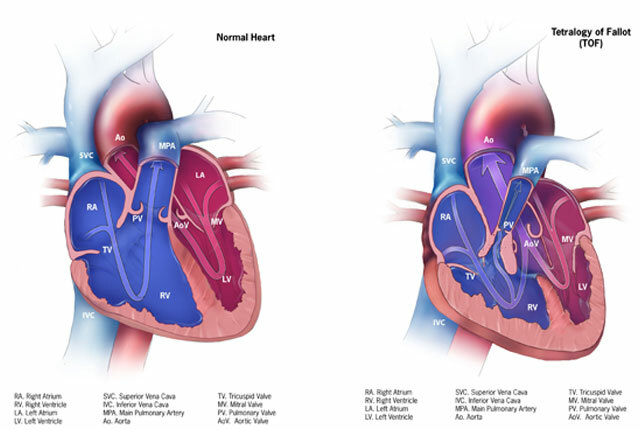 Tetralogy of Fallot is a congenital heart defect which presents with 4 conditions: a ventricular septal defect (a hole between the right and left ventricles), a narrowing of the pulmonary outflow tract (the vessel between the heart and lungs), an overriding aorta (the aorta is shifted to the right instead of being connected strictly to the left side), and hypertrophy of the right ventricle. Each of these components can vary in severity. These defects cause there to be lower oxygen levels in the blood, leading to cyanosis. It is the most common cause of cyanotic cardiac disease in neonates. Patients with TOF may experience a hypercyanotic spell. 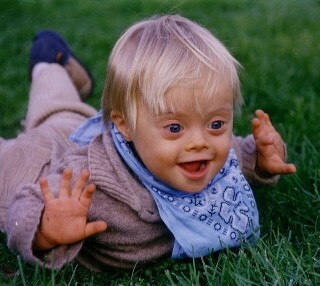 They are not common but they can occur in as young as 2 months of age. These spells are characterized by a sudden decrease in oxygen due to acute, almost complete obstruction of subpulmonary outflow. These spells are a medical emergency and can result in death if not treated. If the child is having a hypercyanotic spell, put his/her knees to chest in order to try to increase venous return to the right side of the heart. Call 911 immediately. Surgery is the first line of defense in children with TOF. Afterwards, they may or may not be on various medications to help control arrhythmias (if they have one) or to help their heart beat more forcefully. Children after TOF surgery may be required to take antibiotics when going to the dentist to get their teeth cleaned, or if they are around someone that has an infection as an act of prophylactic care. MD’s will diagnosis TOF using 3 methods; baby’s signs and symptoms, physical exam, and the results from diagnostic tests. The signs and symptoms that MD's use to diagnosis TOF can be found in the above section. During the physical exam the MD will look for these signs and symptoms and listen to the baby’s heart. A heart murmur is also commonly found with TOF. The diagnostic tests performed include echocardiography, EKG, chest x-ray, pulse oximetry and cardiac catheterization. • Echocardiography – uses ultrasound waves to create a moving picture of the heart. This allows MDs to see any problems with the way the heart is working and clearly shows the four defects and how the heart is responding to them. • EKG (Electrocardiogram) – records the hearts electrical activity. This test will determine if the right ventricle is enlarged. • Chest X-Ray – creates a picture of the chest and the structures of the chest. This will show if the heart is enlarged or if there is any fluid build-up in the lungs, a sign of CHF. • Cardiac Catheterization – used dye injected into the blood stream to determine if blood is mixing between the right and left side of the heart. MDs also use the cardiac catheterization to measure pressure in the chambers of the heart. Tetralogy of Fallot doesn’t directly affect any other systems, but it decreases the amount of oxygen circulating in the blood stream. This decrease in oxygen affects the entire body, and is most noticeable in the integumentary system, bluing of the nails and lips, the musculoskeletal system, decreased endurance and tiring with activity, and the CNS, fainting or passing out. Surgery is the only corrective measures for children born with TOF. 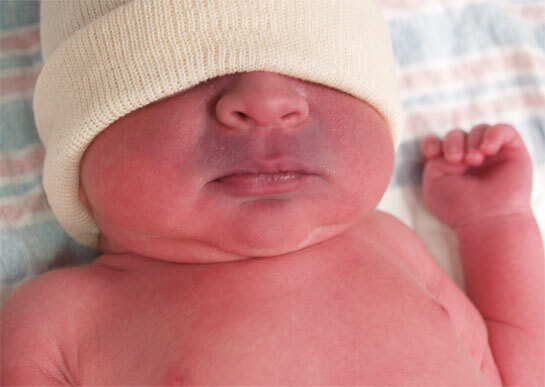 There are two different surgical routes the infant may undergo: early/temporary correction, or complete correction. First though, the neonate may be injected with prostaglandin in order to preserve ductal patency and provide a stable blood source to the lungs. Early or temporary correction is done to increase blood flow to the lungs for a period of time until the child is big enough and ready for complete corrective surgery. In this surgery, surgeons place a shunt between the systemic and pulmonary artery in order for the subclavian and pulmonary artery on the same side to communicate. In a complete repair, surgeons close the hole between the ventricles with a patch, re-channel the aorta to connect with the left ventricle instead of the right, and widen the narrowed pulmonary tract. This surgery is usually performed somewhere between 4-6 months, but is beginning to be introduced in as young as 3 months. A complete repair provides relief of the volume and pressure overload on the right ventricle, minimizing cyanosis (and thus reducing secondary damage to organs), decreasing right ventricular hypertrophy, and reducing the incidence of arrhythmias. Patients who have a successful surgery usually do not need to have another heart surgery in their first year. Longer follow-up is usually necessary with children undergoing a complete correction. There is however, a risk of surgery using the patch between ventricles at such a young age. The patch can create a state of chronic pulmonary regurgitation, which increases morbidity in young adults. This can lead to exercise intolerance and ventricular arrhythmias. The mortality rate of this surgery is less than 3%, and more children are surviving into adulthood than ever before, living normal, healthy lives. In one study, percutaneous balloon dilation was performed on children with TOF for palliative purposes after cardiac catheterization. There was immediate improvement in aortic saturation. At the one year follow up, all of the cardiac lesions were successfully corrected. This study supports that balloon dilatation can be used as an alternative palliative therapy for TOF other than the routine surgery options listed above. Pre-Operative  – Most infants with TOF will receive thoracic surgery to correct the associated abnormalities. The most important physical therapy intervention pre-operative for the patient and family is education. Many institutes are using a method of education that describes a pre-operative program that helps to decrease post-operative complications. Many institutions use a doll to explain to children about the tubes and how to care for them. Post-Operative  – Pulmonary function is a main area of concentration after thoracic surgery. The interventions vary with age but the general goal is the same, to mobilize secretions, increase aeration and increase general mobility. Atelectasis is a concern after thoracic surgery and is caused by the slowed mucous transport, altered breathing patterns, prolonged positioning in supine and diaphragmatic dysfunction in early post-operative period. The yawn maneuver and prolonged inspiration to increase inflation are ways to prevent atelectasis. The incentive spirometry is an effective tool for preventing atelectasis in the pediatric population. Other ways that can be more fun for children are activities such as blowing bubbles or blowing on a windmill. There are expiratory maneuvers but the children typically take a large breath before blowing, thus they become inspiratory maneuvers also. Segmental expansion techniques are effective to increase segmental aeration. These techniques are performed by placing your hand over whichever segment of the lung is not effectively inflating and allowing your hand to move with the respiratory cycle. Gentle pressure may be applied to the chest at the end of the expiratory phase, just before the inhalation phase. This elicits a stretch reflex that facilitates air flow to that particular segment. Percussion and vibration may be performed in conjunction with segmental expansion. Percussion is the rhythmic clapping with cupped hands over the involved lung segment performed throughout the respiratory cycle, with the goal of mechanically dislodging pulmonary secretions. Vibration is performed by creating a fine oscillating movement of the hands on the chest wall just before expiration begins and throughout the expiration phase. If the child does not tolerate percussion and vibration, placing the patient in side lying and gently rocking back and forth may stimulate expansion, secretion motion and relaxation. This technique is affective if the child is upset and may decrease respiratory rate. Positioning may be useful for patients, but certain positions may be contraindicated post thoracic surgery. Check with the MD or nurse before using positioning to make sure that it is safe for the child. 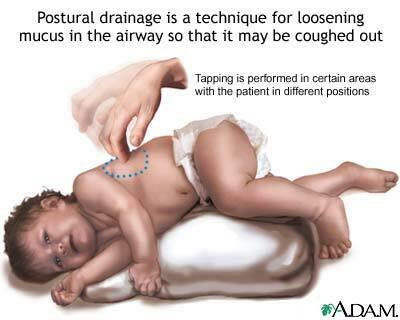 If the child is intubated suctioning may be used to remove secretions from the airways, however children with cyanotic defects (such as TOF) tend to desaturate during suctioning and it is very important to hyperventilate these patients before and after suctioning and to monitor oxygen levels. Coughing is an effective way to mobilize secretions if the patient is able and willing to cough. A teddy bear or pillow can be used by the child to self-splint the incision. Have the child squeeze the stuffed animal against their chest to decrease pain. Range of motion (ROM) exercises should be initiated as soon as possible after surgery. ROM exercises are extremely important with thoracic surgery because this type of incision tends to produce more guarding. Child position should be changed regularly to avoid a pooling of secretions in the dependent part of the lungs and regular position changes reduce the risk of fevers after surgery. Ambulation should be implemented as soon as possible to decrease both pulmonary and circulatory complications. As soon as atrial lines and groin lines are removed, patients should begin to ambulate, even if only 5-10 ft.
Any other cyanotic heart defects, such as, pulmonary stenosis, transposed arterial trunks, common arterial trunk and tricuspid atresia. Patients with heart murmurs will also be tests for persistent pulmonary hypertension. Journal of cardiac surgery. Repair of tetralogy of fallot with ascending and proximal aortic arch aneurysm: case report. This article can be accessed at: http://onlinelibrary.wiley.com/doi/10.1111/j.1540-8191.2011.01236.x/abstract;jsessionid=C04276D6FE49B1D9A235D2FF9D0EEDB8.d04t04? ↑ 1.0 1.1 PubMed Health. Tetralogy of Fallot [updated 2011 Dec 1; cited 2012 April 1]. Available from: http://www.ncbi.nlm.nih.gov/pubmedhealth/PMH0002534/. ↑ YouTube. Tetralogy of Fallot. http://www.youtube.com/watch?v=yePivAlbR4A&feature=youtu.be. accessed 31 March 2012. ↑ 4.0 4.1 4.2 National Heart, Lung and Blood Institute. What Is Tetralogy of Fallot? [updated 2011 July 1; cited 2012 April 2]. Available from: http://www.nhlbi.nih.gov/health/health-topics/topics/tof/. ↑ 5.0 5.1 5.2 Medline Plus. Tetralogy of Fallot [cited 2012 April 2]. Available from: http://www.nlm.nih.gov/medlineplus/ency/article/001567.htm. ↑ 6.0 6.1 6.2 Medscape. Tetralogy of Fallot [cited 2012 April 2]. Available from: http://emedicine.medscape.com/article/2035949-overview#a0101. ↑ 7.0 7.1 7.2 Caplan R, Allen P. Physical activity recommendations for adolescents with repaired tetralogy of fallot: review of the literature and guidelines for practitioners. Pediatric Nursing. 2011;37(4):191-199. ↑ 8.0 8.1 8.2 8.3 8.4 Baillard F, Henderson R. Tetralogy of fallot. Review. Journal of Rare Diseases. 2009 [cited 31 March 2012];4(2). Available from: http://www.biomedcentral.com/content/pdf/1750-1172-4-2.pdf. ↑ Drugs.com. Tetralogy of Fallot; 2012 [cited 2012 April 1]. Available from: http://www.drugs.com/cg/tetralogy-of-fallot-in-children.html. ↑ Ewer A, Middletown L, Furmston A, Bhoyar A, Daniels J, Thangaratinam S, et al. Pulse oximetry screening for congenital heart defects in newborn infants (PulseOx); a test accuracy study. The Lancet. 2011; 378:785-794. ↑ 11.0 11.1 Park Cs, Kim WH, Kim GB, Bae EJ, Kim JT, Lee JR, et al. Symptomatic young infants with tetralogy of fallot: one-stage versus staged repair. J Card Surg. 2010;25: 394-399. ↑ 14.0 14.1 Campbell SK, Palisano RJ, Orlin MN. Physical therapy for children. 4th ed. St. Louis: Elsevier Saunders; 2012.